According to 6Wresearch, Middle East Power Tools market is projected to grow at a CAGR of 9.0% during 2018-24. With stabilization of oil prices, government spending is expected to firm up and construction market is likely to regain momentum. Middle East power tools market witnessed a steady growth during 2014-17 led by buoyant construction activities primarily in UAE and expansion of manufacturing and industrial sectors. Oil crisis led to slowdown in the construction activities across several key markets across Middle East region primarily Saudi Arabia. Additionally, Turkey which is one of key contributors to the power tools market in the Middle East had witnessed political and economic instabilities. 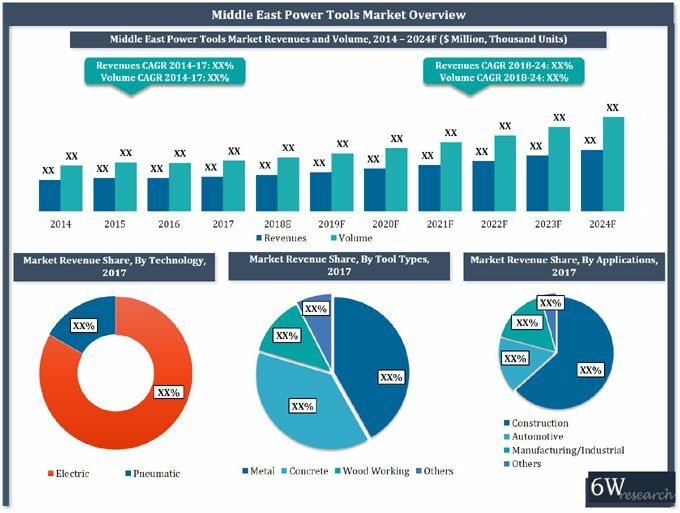 According to 6Wresearch, Middle East Power Tools market is projected to grow at a CAGR of 9.0% during 2018-24. With stabilization of oil prices, government spending is expected to firm up and construction market is likely to regain momentum. Additionally, major global events such as World Expo 2020 in Dubai and Qatar World Cup 2020 are expected to stimulate the growth in the region leading to increased demand for power tools. Additionally, rapid expansion of manufacturing and automotive sectors would further fuel the growth of power tool market. According to Ravi Bhandari, Research Manager, Research and Consulting, 6Wresearch, "Electric power tools segment recorded a healthy growth and remained the key contributor in the power tools market in 2017. This was primarily due to strong demand for cordless power tools and high adoption rates in construction vertical." "During the forecast period, pneumatic power tool segment which currently occupies a low share of the power tool market is expected to register a healthy growth, driven by expansion of manufacturing and automotive hubs across the region, "Ravi further added. According to Rishi Malhotra, Senior Research Analyst, Research and Consulting 6Wresearch, "Amongst all the verticals, construction vertical seized the largest slice of Middle East power tool market. Though, the vertical suffered a setback owing to slump in oil prices and sharp spending cuts, however, it still managed to secure the top spot amongst the other verticals." "During the forecast period, ambitious infrastructure projects in Turkey, UAE and Qatar would possibly keep construction vertical a key contributing region for power tools market vendors. However, verticals such as manufacturing and automotive are expected to expand at a faster pace as compared to construction vertical offering significant opportunities for power tool market vendors, " Rishi concluded. Some of the key players in Middle East Power Tools market includes- Black and Decker GMBH, Hilti Middle East FZE, Hitachi Sales Middle East FZE, Makita Gulf FZE, Robert Bosch Middle East, and Techtronic Industries FZCO. "Middle East power Tools Market (2018-2024)" provides an in-depth analysis with 255 figures and 25 tables covered in more than 290 pages. The report estimates and forecast the overall Middle East power Tools market by technology types, verticals, tools types and countries. The report provides an unbiased and detailed analysis of the on-going trends, opportunities/high growth areas and market drivers which would help the stakeholders to device and align their market strategies according to the current and future market dynamics.